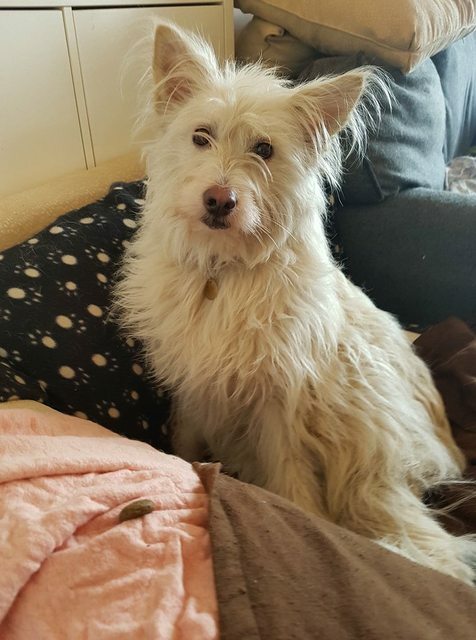 Georgy is a 3 year old female Terrier Cross. Gorgeous Georgy is looking for a very special home. She’s very nervous of people and doesn’t really like being touched. She has made great progress and now can be walked on a lead despite not being keen on new people or dogs. She is a flight risk so needs a very secure home. Georgy needs another confident dog around as she became quite depressed in a home as the only dog. She isn’t keen on bigger dogs but will learn to live with them with careful introductions. A playful but respectful dog friend would be lovely. She can’t be homed with children. We do know she isn’t bothered by degus so she is probably okay with small furries! Despite her fears she is a really easy dog to have around, quiet and clean in the house. Is happy to be left for a few hours and non destructive. She loves her cosy bed so spends most of her time snoozing! She’s not really one for toys and isn’t a very giddy dog and doesn’t need a lot of exercise so might be a good dog for someone who doesn’t want to spend hours walking a dog. She will probably never be a lap dog but seeing her turn into the happy dog I know she can be will be one of the most rewarding experiences. I’m probably asking a lot, not many people want to adopt a dog that may never want to cuddle but I’ve got a very similar dog myself and she brings me so much happiness. Perhaps there are other people out there like me that are happy to add another easy going dog to their pack and not ask for anything else in return. 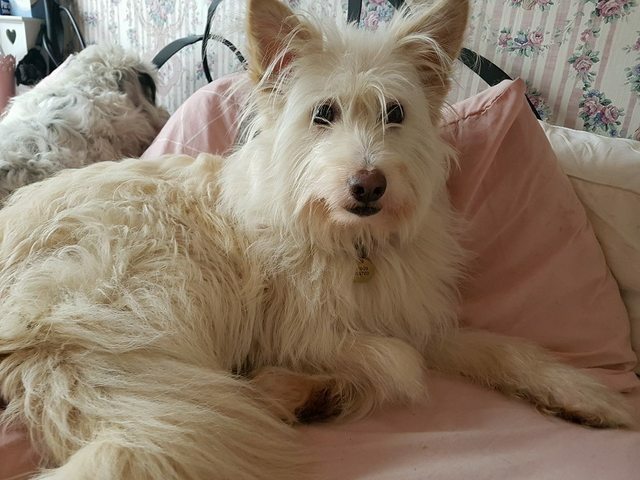 Georgy is 3 years old and a Terrier cross. Shes about the size of a spaniel or small border collie. She is neutered, chipped and vaccinated. Adoption fee £300..Homecheck applies and preference given to adopters in the Yorkshire area so that I can support the transition to a new home.